Vehicle technology is continually advancing to meet consumer demand for better fuel economy, as well as government requirements for fewer emissions. The result is downsized engines with less displacement for fuel combustion, forcing original equipment manufacturers to design advanced spark plugs using precious metals to improve engine performance and reliability. These modern ignition systems require dual precious metal spark plugs capable of supplying the highest voltage outputs to date. Original equipment precious metal spark plugs also feature specialized firing and ground electrode designs like dual fine (DFE) and projected square platinum (PSPE). 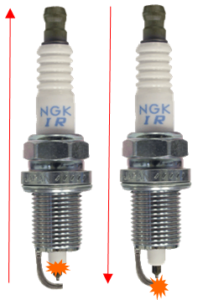 In combination with modern ignition systems, these spark plugs can withstand up to 40,000 kV. Understanding modern ignition systems, and why they increasingly require advanced spark plugs, will help complete preventative engine maintenance during tune-ups. Waste spark systems became popular because of the efficiency and reliability with two spark plugs per ignition coil. While standard ignition systems fire once per combustion stroke, waste spark systems fire twice, once on the combustion stroke and once on the exhaust stroke. Standard ignition systems typically fire with only a negative polarity, sending electricity from the center electrode to the ground electrode. 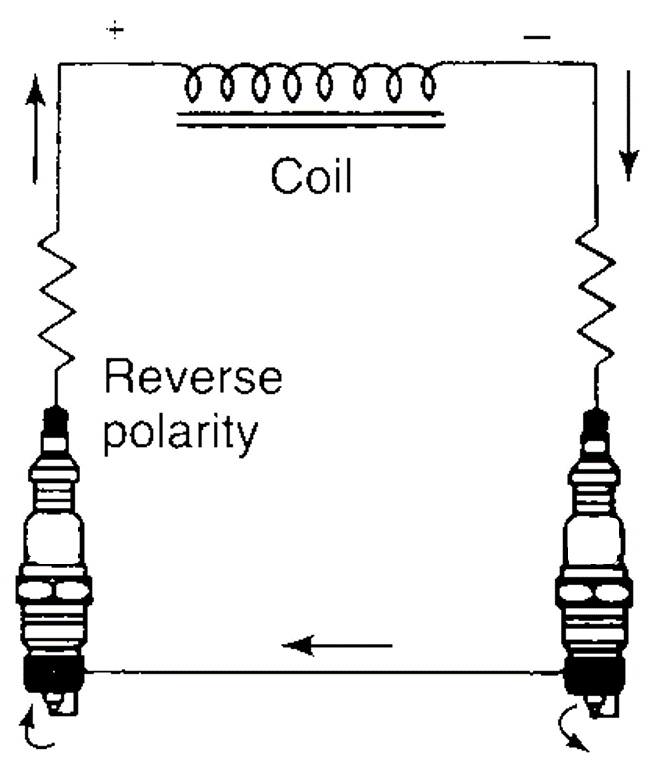 Every time the ignition fires, a small amount of gap erosion occurs on the electrode with negative polarity. 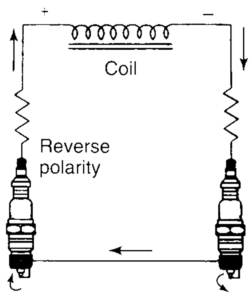 In a waste spark ignition system, the coil sends voltage down a spark plug to the ground electrode. On the shared circuit, the paired cylinder is being fired on a waste spark. The waste spark is accomplished by recapturing the remaining voltage through the ground electrode and firing to the center electrode, completing a circuit (Figure 1). Figure 1: Circuit in a waste spark system. The cylinder where the spark travels from the center to the ground electrode will wear on the spark plug’s ground electrode. The cylinder where the spark travels through the ground to the center will wear on a spark plug’s center electrode (Figure 2). Not using dual-precious metal spark plugs can result in uneven wear on the spark plugs and possible misfires. Installing spark plug with the correct material types recommended by the OEM ensures long-term satisfaction with customers and prevents unnecessary comebacks with otherwise preventable ignition related repairs. This article is sponsored by NGK Spark Plugs. For more information about modern ignition related repairs, please contact NGK’s Technical Support Team at (877) 473-6767 ext. 2 or visit www.ngksparkplugs.com.